Atlantis (in Greek, Ἀτλαντὶς νῆσος, “island of Atlas“) is a legendary island first mentioned in Plato‘s dialogues Timaeus and Critias. In Plato’s account, Atlantis was a naval power lying “in front of the Pillars of Hercules” that conquered many parts of Western Europe and Africa 9,000 years before the time of Solon, or approximately 9600 BC. After a failed attempt to invade Athens, Atlantis sank into the ocean “in a single day and night of misfortune”. Scholars dispute whether and how much Plato’s story or account was inspired by older traditions. 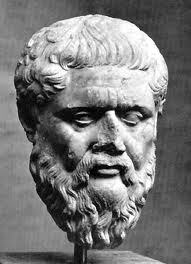 Some scholars argue Plato drew upon memories of past events such as the Thera eruption or the Trojan War, while others insist that he took inspiration from contemporary events like the destruction of Helike in 373 BC or the failed Athenian invasion of Sicily in 415–413 BC. The possible existence of a genuine Atlantis was discussed throughout classical antiquity, but it was usually rejected and occasionally parodied by later authors. As Alan Cameron states: “It is only in modern times that people have taken the Atlantis story seriously; no one did so in antiquity”. While little known during the Middle Ages, the story of Atlantis was rediscovered by Humanists in the Early Modern period. Plato’s description inspired the utopian works of several Renaissance writers, like Francis Bacon‘s “New Atlantis“. Atlantis inspires today’s literature, from science fiction to comic books to films. Its name has become a byword for any and all supposed advanced prehistoric lost civilizations.